Christiane Diehl is a multi-faceted designer with one foot in jewelry, one in landscaping and (err…) one more in photography. 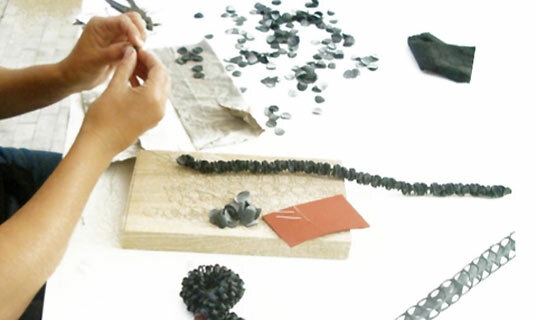 Her unique line of jewelry features necklaces, bracelets and rings — all made from recycled rubber from bicycle tubes and air mattresses. From her Hanover, Germany studio, Christiane cuts tiny shapes out of these reclaimed materials and strings them together in to create these multi-dimensional and dynamic wonders. Through her work in landscape architecture, photography, and jewelry design, Christiane reveals a deep interest in the significance of everyday details. Her rubber jewelry exemplifies this work– proving that everyday, and often overlooked, material can be transformed into something unique and unusual with a bit of creativity. Those are really beautiful and so creative! I wonder if they smell like rubber though? Seems like all jewelry should be recycled at this point, since we have so much watsed materials available. Christiane Diehl is a multi-faceted designer with one foot in jewelry, one in landscaping and (err...) one more in photography. Her unique line of jewelry features necklaces, bracelets and rings -- all made from recycled rubber from bicycle tubes and air mattresses. From her Hanover, Germany studio, Christiane cuts tiny shapes out of these reclaimed materials and strings them together in to create these multi-dimensional and dynamic wonders.